The fun doesn't stop when the sun goes down! Join us for special after-hours family night out at Science Museum Oklahoma. SMO's Late Nite Labs include unique hands-on activities, Science Live and Kirkpatrick Planetarium shows, and all of the museum's permanent exhibits. 6-10 p.m.; Arrive by 7 p.m. so you don't miss any of the fun! All children must be accompanied by an adult. One adult for every six children in attendance, please. Feb. 8, 2018: Tinker 'Bout It — It's time to tinker! 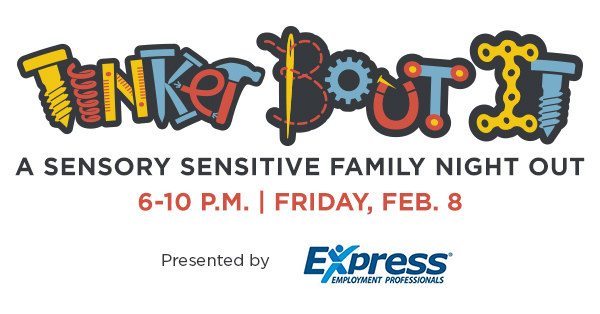 This Late Nite Lab presented by Express Employment Professionals will feature all the fun of the museum with a quieter environment. Learn candle making, explore animation, or just enjoy an evening exploring the museum after dark. This Late Nite Lab is ideal for families who prefer a quieter experience at the museum, however, all families are welcome and the event is not exclusive to guests with sensory-sensitive needs. *Seating in the Kirkpatrick Planetarium is on a first-come, first-served basis. Arrive early to secure your seat!